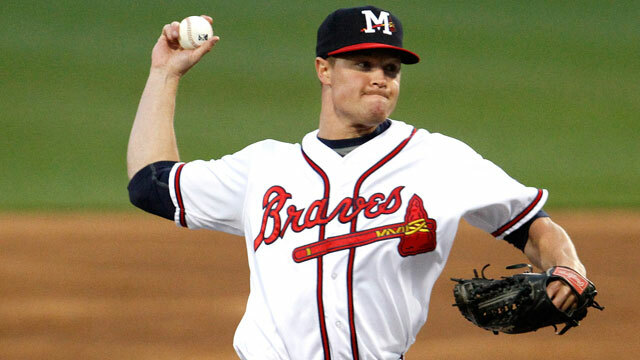 PEARL, MS -- Atlanta Braves RHP Shae Simmons is scheduled to join the Mississippi Braves during the upcoming homestand and is slated to appear in Wednesday's game at Trustmark Park to continue his rehab assignment after undergoing Tommy John surgery last year. Simmons, 25, began his ML Rehab assignment at Triple-A Gwinnett on May 16. He tossed two scoreless innings for the G-Braves-one on May 16 and one May 18. He joined the Rome Braves and made one scoreless appearance with the Low-A Braves on May 21. In 26 big-league games, Simmons is 1-2 with one save and a 2.91 ERA. He was sidelined with a right shoulder strain in late July 2014 and underwent Tommy John surgery in February 2015. The right-hander from Missouri was called up by the A-Braves from Double-A Mississippi on May 31, 2014, becoming the 15th M-Brave to receive a direct call-up to the show. At the time of his call-up in 2014, Simmons was leading the Southern League with 14 saves on the season. He had a 0.78 ERA in 20 outings for the M-Braves. In those 20 appearances, he gave up runs in just one outing and recorded 30 strikeouts in 23 total innings pitched. Simmons made his professional debut in 2012 with the GCL Braves, giving up no runs in seven outings before moving on to R-Danville (0-2, 3.48). Simmons began the 2013 season at Low-A Rome where he went 1-1 with a 1.49 ERA in 39 outings before being promoted to Double-A Mississippi in August. He had not allowed a run since May 17 that year. In 2013, Simmons led the Braves farm system in saves (24), ranked third in opponent's batting average (.163) for relievers, second in relievers ERA (1.69), fifth in relievers WHIP (0.99) and tied for sixth in total games pitched (50). He was selected as a South Atlantic League Mid-Season and Post-Season All-Star and was named 2013 Pitcher of the Year in Rome. Simmons was selected by the Braves in the 22nd round of the 2012 draft out of Southeast Missouri State University.